The SNS user trend survey, conducted by the consumer trend analysis service provider Nielsen, finds that a Japanese used SNS apps in 17 days a month or for 36 minutes a day on average. The highest usage rate a month was found in Facebook and Twitter (40% each), followed by Instagram (20%). A major reason for use of the three SNS apps was to kill time with the ratio of 30% or higher. According to the survey results, general images were to see snappy photos or movies, to see interesting photos or moves and to motivate senses for creativity for Instagram, to know what happens today and to get updated information for Twitter. No particular image was found in Facebook compared to Twitter or Instagram, but Japanese relatively have strong images of necessary for life or to get useful information for work. Twitter had the most users in 10’s (75%), however the user ratio was lower in older ages. In 10’s, the ratio of using Twitter one time or more a day was 58%, and the ratio of four times or more a day was 22%. 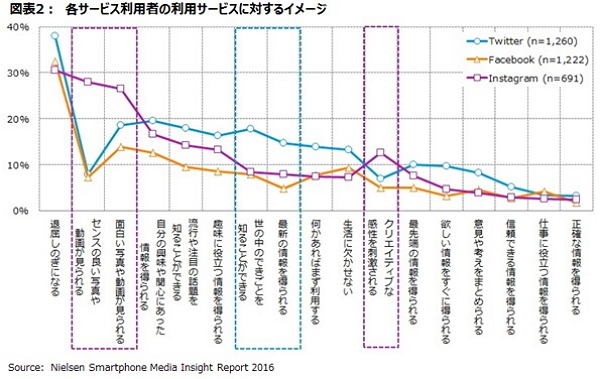 The survey was based on Nelsen Mobile Net Review in May 2016 for 8,000 smart phone users in Japan and Smart phone Media usage survey in June 2016 for 2,989 smart phone users. Facebook, Twitter, Instagram, Google Plus and mixi were subject to the survey.